This paper is a bibliographical research on Amina Wadud’s thought about faraid with istihsan theory. The main problem is about the style of Amina Wadud’s thought which is considered by some people to be contrary to the building of the Shari’ah. The construction of Amina Wadud's thoughts on faraid is built on the foundations of hermeneutical analysis with a justice and gender equality approach. She focuses on the Qur’an in chapter al-Nisa’ verses 11 and 12. The author finds that although Amina Wadud used the hermeneutic approach and the principle of justice and gender equality, there is still much room for criticism when viewed from the perspective of istihsan . 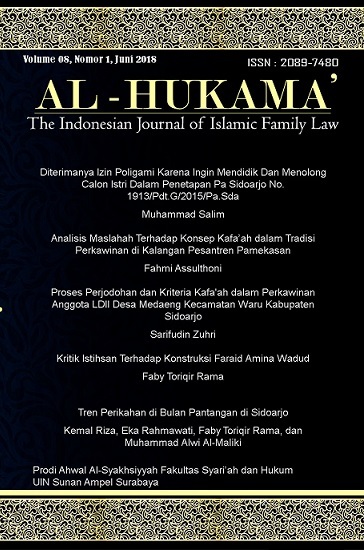 First, Amina Wadud does not write that Islamic law is in fact flexible, as evidenced by the takharruj mechanism which is essentially an istihsan product. Second, less exploration of the shari’s proposition. Amina Wadud has a remarkable rhetoric and depth of philosophy. But in the field of faraid discussion he narrows himself to the use of the Qur’an without considering any other propositions. Third, istihsan bi al-nas-one kind, istihsan-writer uses to fight her improper argument about the concept of naf’a which he introduced herself by referring to chapter al-Nisa’ verse 11.